Last year, in honor of National Poetry Month, I shared 32 poetry pairings (that's a total of 64 poems!) so that you could host a poetry tournament in your classroom. If you can't wait until April, there's still time for you to use the same poems to create a March Madness bracket. You can find the paired poems and tournament directions here. Many students are intimidated by poetry, so using music can help you ease them into poetry analysis as there's really no difference between looking at the lyrics of a song and the lines of a poem. 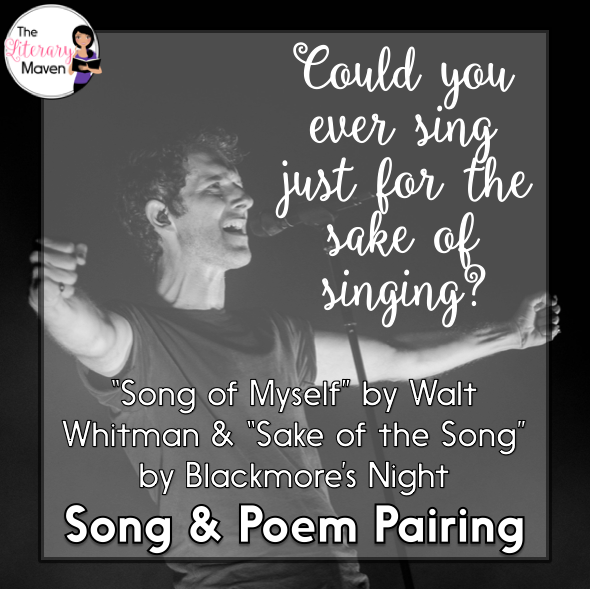 These 15 song and poem pairings will also help you to tackle the analysis of "how two or more texts address similar themes or topics in order to build knowledge or to compare the approaches the authors take." If you are in a Common Core state, that's Reading Anchor Standard #9, and if you are not a Common Core state, it is still a worthwhile exercise. This is an easy pairing to start out with as the song is simply a retelling of the poem. I like to show students the lyrics first before playing the song for them as hearing the music that accompanies the lyrics can be quite a surprise. Tiger Army is considered a psychobilly band, part of the rock music fusion genre that mixes elements of rockabilly and punk rock. After listening, discuss with students whether the music changes the meaning and tone of the lyrics. This pairing is also a perfect addition to your unit on Edgar Allan Poe. Students love the lighthouse imagery in each of these texts, and are quick to suss out the symbolism. However, once they push further, they can analyze the different perspectives offered (the song is from the POV of a lighthouse, while the poem's narrator simply admires and assesses the lighthouse from afar) and the impact on the audience. Both texts together work well to show students the effect of mood and tone. The song also works well alone as a first foray into song analysis as it offers a rich melody and emotional lyrics. One of the verses of "Sake of the Song" reads, "Could you ever be just for the sake of being? Could a melody ever be wrong? Could you ever sing just for the sake of singing? Set your spirit free for the sake of the song." Those lines capture much more simply, and succinctly, Whitman's message in "Song of Myself." I don't suggest reading the whole poem with students. I recommend just the first three sections unless you assign each student a different section or two (there are 52 total) to try to translate. Add this pairing to your American Literature unit. "All the lonely people, where do they all come from?" Each of these texts creates a rich character sketch of someone who wears a mask for the world, but deals with some tough emotions. These two texts offer easy opportunities for comparison: both have strong settings and character development. I like to have students follow up with writing their own character portrait poetry, zooming in on someone real or made up. Students always surprise me by creating an intense portrait in a very small amount of space. With this poem and song, students can consider the poet and artist's feelings about death. Do they fear death or do they welcome it? How do the poet and artist feel about the life they have lived? Both the poem and song have lines that require some thinking. For example, what does Terry Jacks mean when he sings, "But the stars we could reach were just starfish on the beach"? In Dickinson's poem, students can examine her use of personification. How does death become a character in her poem? Students can also consider her use of capitalization and how it affects (or doesn't affect) meaning in the poem. Forbidden love is a theme that always engages my students. When my freshmen read Romeo and Juliet, I begin with a thematic hook. As a class, we listen to songs like Avril Lavigne's "Sk8er Boi" and The Shangri-Las "Leader of the Pack." We also read "Pyramus and Thisbe" and discuss popular movies like Shrek, Hitch, Divergent, Lady and the Tramp, and the Titanic. All of these examples help us pose the question: Why are stories of forbidden love so popular? As students make connections, offer opinions, and draw thematic conclusions, we prepare to begin Shakespeare's play. This discussion is the perfect way to make classic poems relevant. Why read Romeo and Juliet? Why read "Pyramus and Thisbe"? The stories reflect modern issues that impact modern teens. 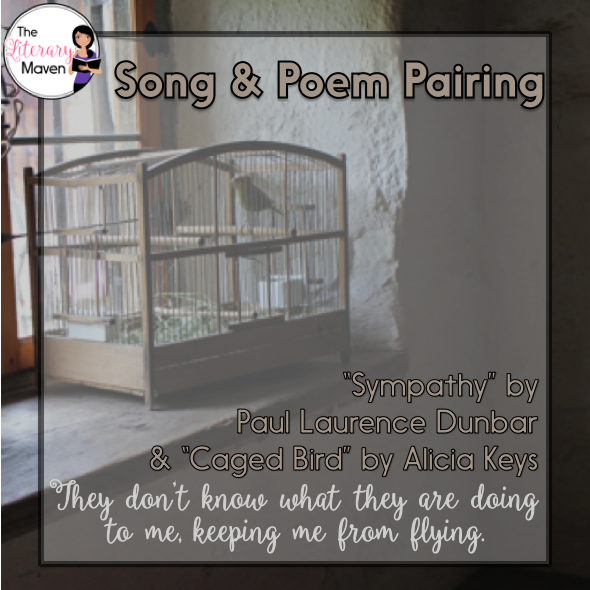 The lyrics of "Caged Bird" are a direct nod to Dunbar's poem. In comparing the poem and song, first have students focus on the birds. What are the conditions of their imprisonment? Then move on to the tone of the poet and artist. Are they similar or different? How does that connect to the experiences of the birds? Finally, have students discuss the use of the different gender pronouns. How does Dunbar's use of he and Keys's use of she potentially transform the meaning in the poem versus the song? Poetry challenges many students, but I’ve found that if you can present songs as poems, you can often get students to have a better understanding of their reading. In fact, when I introduce American Literature at the beginning of my semester, I use poetry, music, and art to get students engaged. One of my favorite pairings is to use “Let America Be America Again” by Langston Hughes with “The Times They Are A-Changin’” from Nobel Prize winner Bob Dylan. Both the poem and song share a purpose to improve American society, the song as an anthem for the Civil Rights movement and the poem as an appeal for equal treatment of all Americans. Excellent for analysis of poetic devices, both include examples of rhyme, alliteration, figurative language, symbolism, and allusion. If the poem is too long or complex for your students, Hughes’s “I, Too” also makes a strong connection to the song. As their titles suggest, both this poem and song focus on the road, a symbol of our journey in life. Once the symbolism is discussed, you can have students practice identifying rhyme scheme. Do students prefer one pattern over the other? This pairing can also lead to a deep philosophical discussion about choices and fate. Robert Frost maintains that "Two roads diverged in a wood, and I— I took the one less traveled by, and that has made all the difference, " while George Harrison claims that, "If you don't know where you're going, any road will take you there." Poll your students for their opinions on whether our fate is pre-determined or whether the choices we make determine our fate. Then allow students to debate the question using examples from literature. These two voices are so distant in time and genre, but share such a scrappy, unapologetic sense of pride for their cities. Both poets use a counter argument structure: they acknowledge the faults of their cities, then come right down and defend their homes. Stump identifies the “unethical politician” while Sandburg references having “seen the gunman kill and go free to kill again.” The reason I enjoy pairing these two together is because Stump’s version is so simple and approachable. His language is plain and the song is catchy, so it makes for a nice scaffold. Once you layer on “Chicago,” the language gets more difficult, but since you’re approaching it in the same context as “This City,” the students already have a frame for the poem. As you look through these parallels with students (and there are several more! ), I would suggest focusing in on four major aspects of the poems: the tone, the message, the speakers, and the figurative language. Depending on your class, you might even narrow that list down to just two things to focus on. 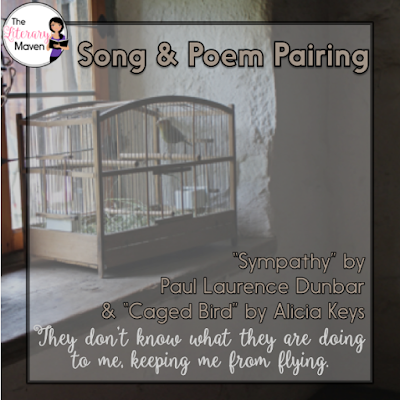 I use a structured Venn diagram lesson as well as a deeper analysis writing activity with these two poems that would also work with any other pairing. 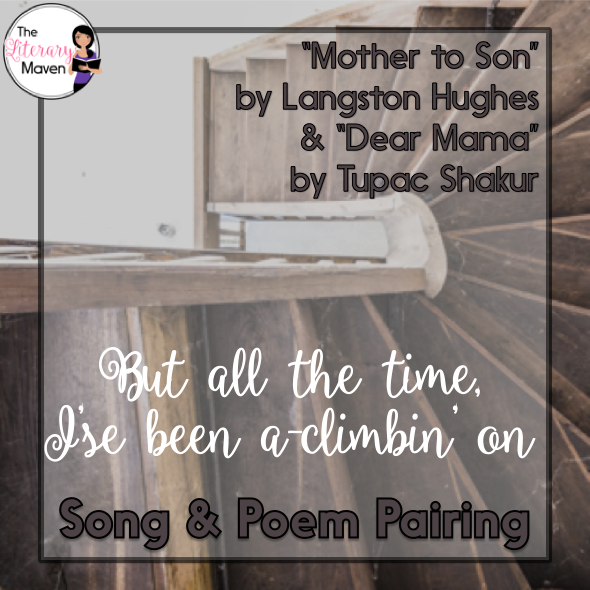 Paired together, this poem and song create a beautiful dialogue of a mother sharing her struggles with her son and a son recognizing the difficulties faced by his mother. After sharing with students that the poem was published in 1922 and the song was released in 1995, discuss what the "tacks" and "splinters" might symbolize in Hughes's poem and if they are the same types of struggles Tupac's mother endured. For a more contemporary song, you could also use "Hey Mama" by Kanye West (just be sure you are comfortable with all of the language before sharing it with your students). As a follow up to reading, students could write their own mother to son, father to daughter, etc. piece and a response, which are wonderful writing pieces for students to give as gifts. My sophomores love our poetry unit because I infuse music throughout it as often as possible. Music is such a powerful way to teach poetic and rhetorical devices, but it can also bring poems to life. When paired well, music can make the thematic relevance of a poem tangible. Our poetry unit explores various poem structures, one of which is narrative. We use "The Fish" by Elizabeth Bishop because it's so rich in imagery - an important story element. In order to hook students, we surround this poem with multiple examples of songs that have a similar theme of resiliency. As we listen to "Hall of Fame" by The Script, "Fight Song" by Rachel Platten, and "It's Not Over Yet" by King and Country, we analyze the message, the author's purpose, and the social, cultural, and historical significance of the songs. With this prior knowledge in tow, we read "The Fish" and make as many connections as possible between characters and themes in the poem with those in the lyrics. It's fun to use the same analyzing music assignment when reading the poem as when studying the songs to prove to students that music really is poetry. My students always love this study because it makes poetry engaging, they get to listen to music, it scaffolds analysis, and everyone leaves in a good mood. Teenagers themselves have quite a bit to overcome, and our discussions often focus on positive ways they can address their own obstacles. The importance of time versus money is at the center of this comparison. "Saturday's Child" is narrated by a child reflecting on his impoverished childhood, while "Cat's in the Cradle" is narrated by a father who regrets not spending more time with his son. Both the poem and song make reference to a silver spoon, but have students determine whether the allusion has the same meaning in both pieces. "Saturday's Child" can be examined for personification and irony can be discussed with "Cat's in the Cradle." Few can resist a love story and a classic song. The combination of the two make Alfred Noyes' poem, "The Highwayman," and Fleetwood Mac's song, "Everywhere," a perfect combination for bringing narrative poetry into the class. I begin with the poem. Students dissect the narrative elements and tease apart the storyline. We talk about what happens and the poetic devices Noyes uses. (It's strong on repetition, rhyme, alliteration, similes and metaphors.) Then students listen to the Fleetwood Mac song and watch the video. We discuss the similarities, the themes of each, and the ways the song's video connects to the poem. If there is time for more, we compare both to other song and video renditions. In the end, students have a solid appreciation for narrative poetry and this poem. Introducing them to a classic song and band is a bonus. Begin with a comparison of tone and theme as you examine "Choices" and "Change." 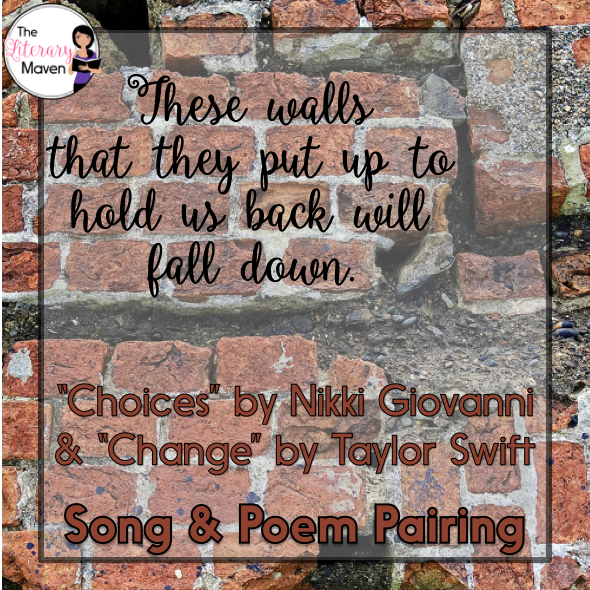 While both the poem and song deal with the quandary of not getting what you want, Giovanni and Swift have very different attitudes about their problems, which results in the presence of two very different messages. "Choices" is from Giovanni's poetry collection titled Cotton Candy on a Rainy Day, which was published in 1978, and "Change" is a song from Swift's album titled Fearless, which was released in 2008 and used during the 2008 Summer Olympics. Discuss whether students attribute the difference in tone and theme to the time period, the women's racial identities, or a combination of both. What made Swift's song an appropriate choice for the Olympics? After reading, students could write about the changes they'd like to make in themselves or the change they'd like to see in the world. 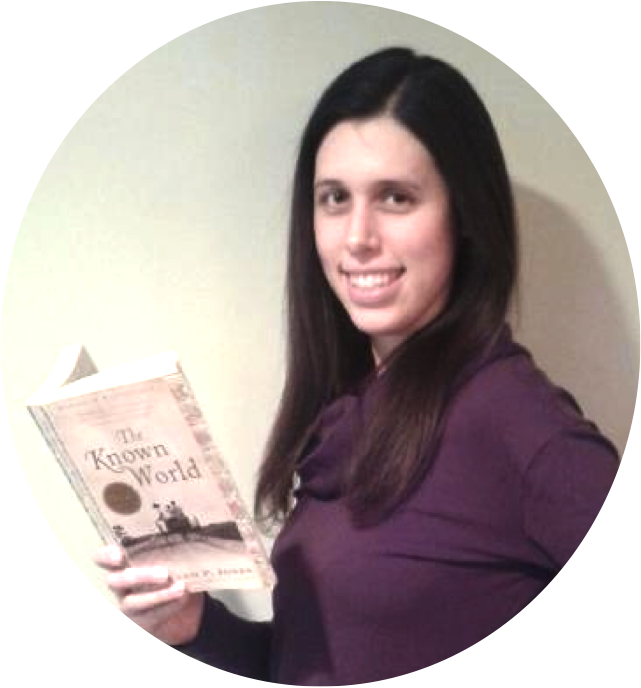 You can find all of my resources for teaching poetry here. 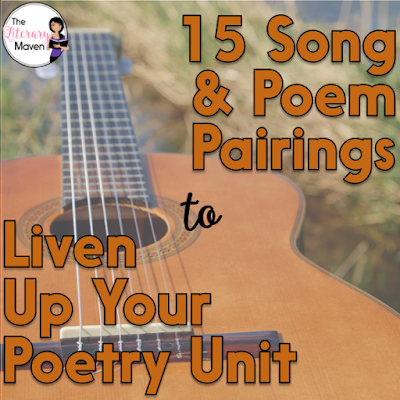 For more song title suggestions and ways to use them in your English Language Arts classroom, check out this blog post: 15 Songs to Use in ELA. You are welcome! Any favorite pairings you would add? I am teaching "This is America" by Childish Gambino with "Dream Boogie" by Langston Hughes. We'll see how it goes.. I am doing This is America and Let America be America Again. They kids (low performing 9th graders) picked up on the connection with "Make America Great Again." Thanks for adding another pairing! Love this list! I would also add "Mystic" by Sylvia Plath paired with Sarah MacLachlan's "Angel." Hi! I am planning to use "The Charge of the Light Brigade" and Iron Maiden's "The Trooper" as well.